Ashburn, Va. (October 16, 2017) – On August 25, 2015, Hurricane Harvey, the first major hurricane to make landfall in the U.S. since Hurricane Wilma in 2005, made landfall near Rockport, Texas, at peak intensity. Ultimately, Harvey would become the wettest tropical cyclone on record in the U.S. resulting in the flooding of hundreds of thousands of homes, displacing more than 30,000 people, and prompting more than 17,000 rescues. Among the thousands of people displaced from the storm were two apartment-home reservists at Eagles Trace, an Erickson Living community in Houston, TX. Both lost everything in the flood. In an effort to expedite their moves into their new Eagles Trace homes, sister community, Ashby Ponds in Ashburn, Va. turned to their Erickson Realty and Moving Services preferred partners for furniture and moving donations. Both Belfort Furniture and Town & Country Movers, Inc. work with Ashby Ponds staff to routinely provide moving assistance to new residents moving to the community. “A part of Belfort’s mission is to 'enhance the lives of the people and community we serve' so we always strive to help those around us in need,” says Matt Huber, Belfort’s executive vice president. “While Houston is not in our immediate neighborhood, when we learned that one of the sister communities of Ashby Ponds had been greatly affected by Hurricane Harvey, we knew we had to help." Belfort Furniture donated furniture to completely furnish the two apartment-homes including, a sofa, loveseat, end tables, lamps, dining table and chairs, cocktail table, a television console, queen bed, dresser, chest of drawers, night stands, bedroom chairs, and mattresses. To transport the donated furniture to Houston, Town & Country Movers, Inc., who help hundreds of people move to Ashby Ponds each year, jumped at the opportunity. In addition to transporting the Belfort Furniture donations to Eagles Trace, Town & Country filled the remainder of the 50+ foot moving trailer with local community donations for the Houston Food Bank. Thanks to the efforts of a special Northern Virginia retirement community and its business partners, more than 1,400 miles away, a single 89-year-old woman who loves to garden, listen to music, and socialize and an 86-year-old man whose single-family home filled with over a foot of water, destroying his clothing, furniture, and car, are now enjoying a wonderful new life at Eagles Trace. 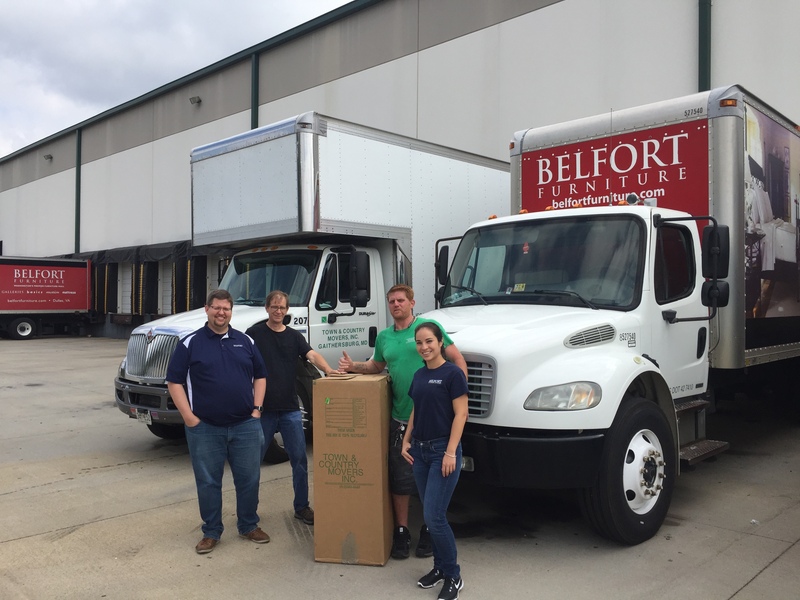 Photo: Belfort Furniture and Town & Country staff preparing for transport of furniture and supplies to Eagle’s Trace in Houston, Texas.